It’s a good call. 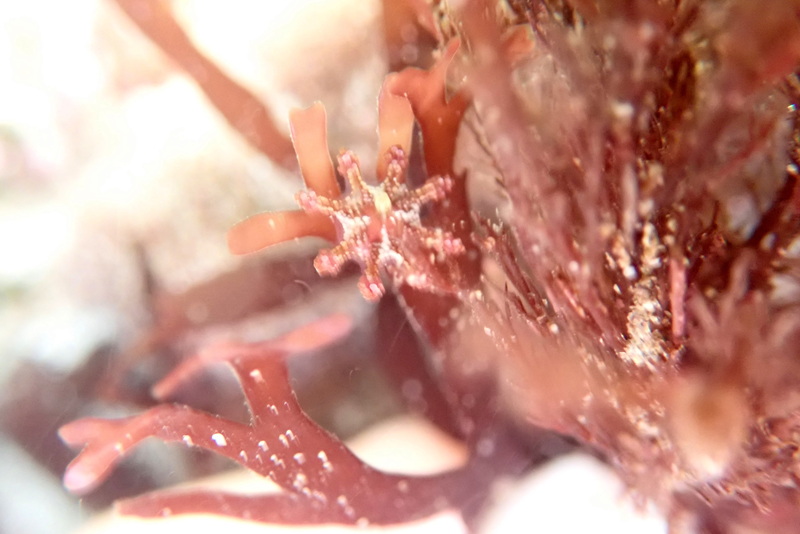 You never know what might be lurking in the rock pools. Near where I saw the movement is a sandy coloured lump. I think I recognise the shape, but it’s only when I lower my camera into the water and zoom right in that I can be sure. 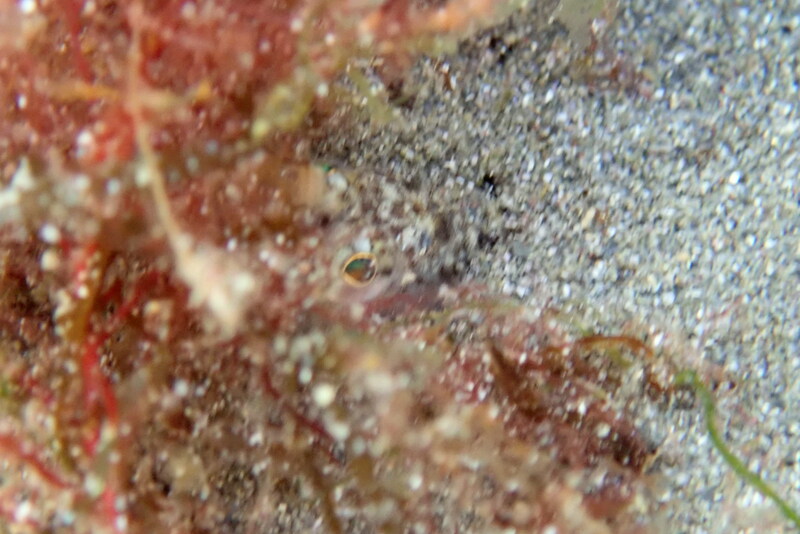 A Lesser weever-fish is staring down my lens, its frog-mouth gaping slightly, the rest of its body buried in the sand. Before I can take a shot it’s gone. Junior gasps when I tell him. We’ve seen these fish in Plymouth Marine Aquarium many times and he knows that they are the main reason we wear beach shoes when we go in the sea. Poison-tipped spines on the weever fish’s dorsal are responsible for many painful injuries every year. They like to lurk, part-buried in the sand with their protective fins up, waiting to snap up passing morsels. 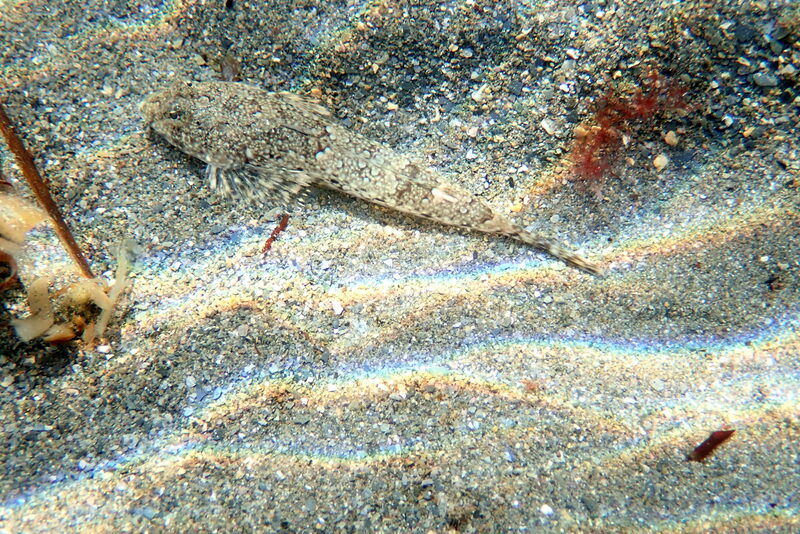 A Lesser weever fish out of the sand. The first fin on its back has the poison-tipped spines. It’s the first time I’ve ever come across Weever fish on the shore as they’re usually out on the shallow sea bed, but they seem at home in this pool. The longer we look, the more fish see. As soon as they notice us or the camera moving they wiggle away backwards into the sand. In their sandy holes, the Weever fish are hard to spot. Just the eye is visible in this shot. Even when they’re lying exposed at the bottom of the pool, their sandy colouration makes them hard to spot. I count a dozen of Weever fish, but there are probably more and I’m cautious about putting my hands down anywhere. 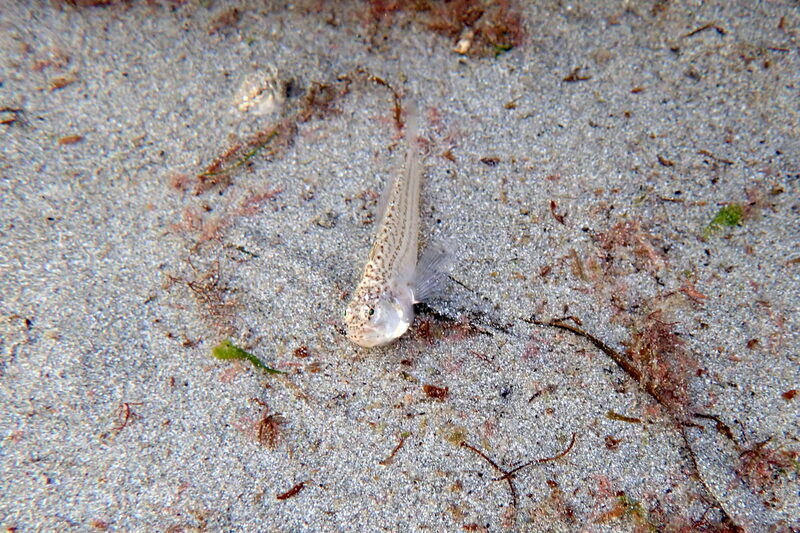 A Lesser weever fish about to wriggle away into a sand burrow. Another is already buried behind it to the left. 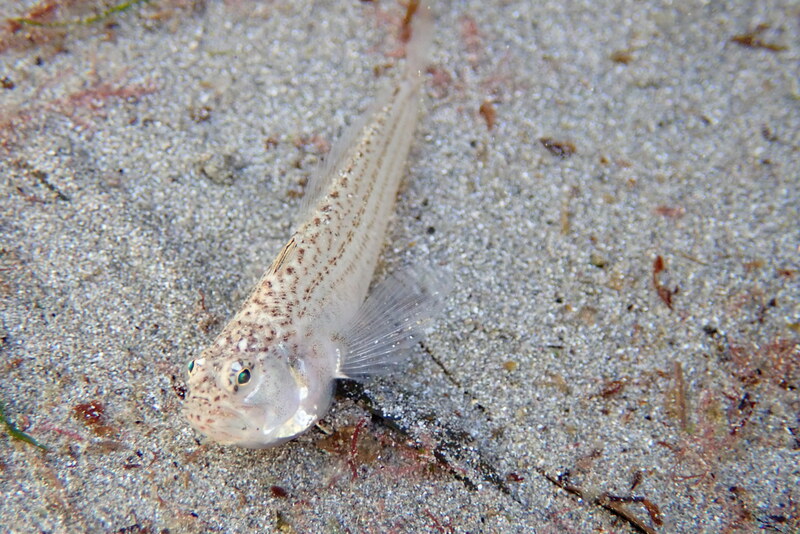 Junior wanders off to do some digging and unwittingly uncovers another Weever fish. We’re glad to be wearing wellie boots today. Just a few weeks ago this beach was packed with bare-footed children, but today we’re the only ones here. In case you’re wondering, Weever fish stings are very painful but not normally serious. If you’re stung, the advice is to bathe the infected area in water as hot as you can stand. The proteins in the toxin break down above 40 degrees, so weeing on the wound won’t help! Across the rocks we find more stinging creatures, but these ones aren’t any danger to us. 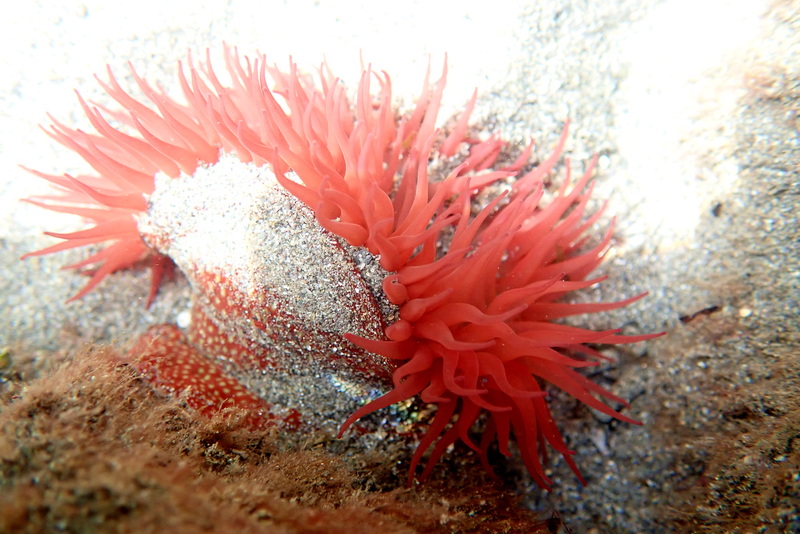 It’s a relief to be able to position my camera without fear of injury to capture this colourful strawberry anemone. The stinging cells in this Strawberry anemone can’t hurt me and it doesn’t swim away – it’s much easier to photograph! We also spot some stalked jellyfish, a designated feature of the Marine Conservation Zone here in the Looe and Whitsand Bay area. The white spots on the bells of the jellies are the stinging cells (nematocysts) but they’re not powerful enough to hurt humans. 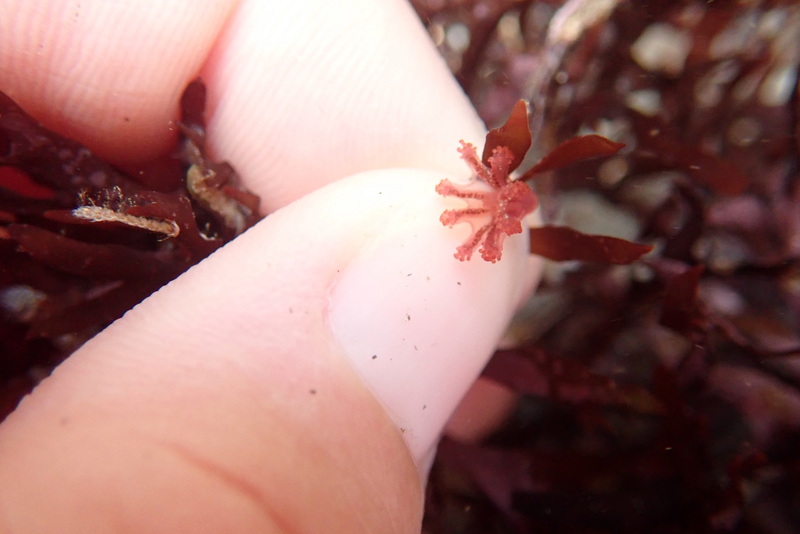 A small but lovely Calvadosia campanulata stalked jellyfish. 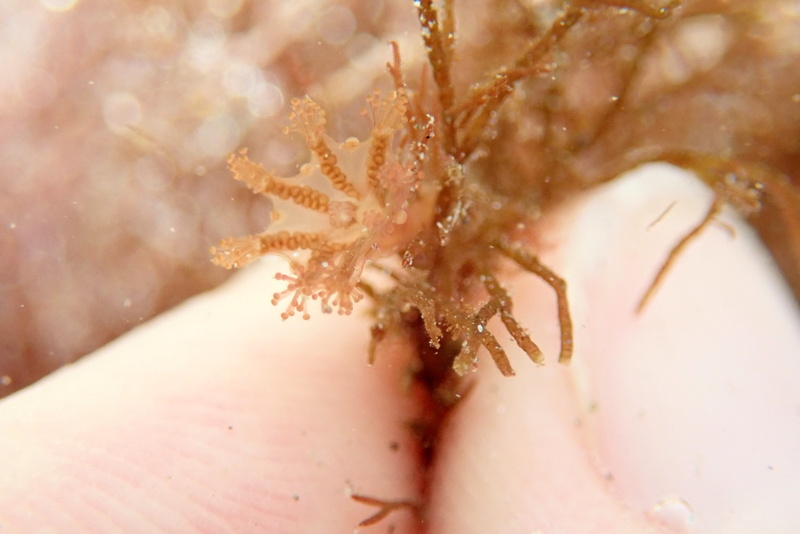 A second species of stalked jellyfish, the Haliclystus octoradiatus. A third species, Calvadosia cruxmelitensis, in too much current to get a sharp photo. I look everywhere and feel disappointed that the Portuguese Man O’War jellies are nowhere to be seen, but at least we’ve avoided injury this time. I’ve been stung, very painful. Another lovely post. I too was stung by a weaver fish when I was about 10 years old at Carne beach in Cornwall. It was extremely painful, but it never stopped me becoming a marine biologist. Thanks Scooj. Sorry to hear about your encounter with a weever fish. I’ve managed to get away without being stung so far but seeing them all in the pool the other day made me realise how close I’ve probably come! Fortunately there aren’t too many things that can hurt you in the British pools. I’ll keep taking my chances!